In retrospect the idea of spending only two and a half days in Tokyo is…well…sad. I like this city much more than I expected to when I booked only a couple of nights here, as a way to break up the long journey to The Land Down Under. I didn’t do or see nearly enough and I’ll miss the civility, the orderliness and the precision of the Japanese culture. Bowing is still important here and I could sure get used to it. Train attendants bow to the occupants of each car as they enter, and again as they exit. 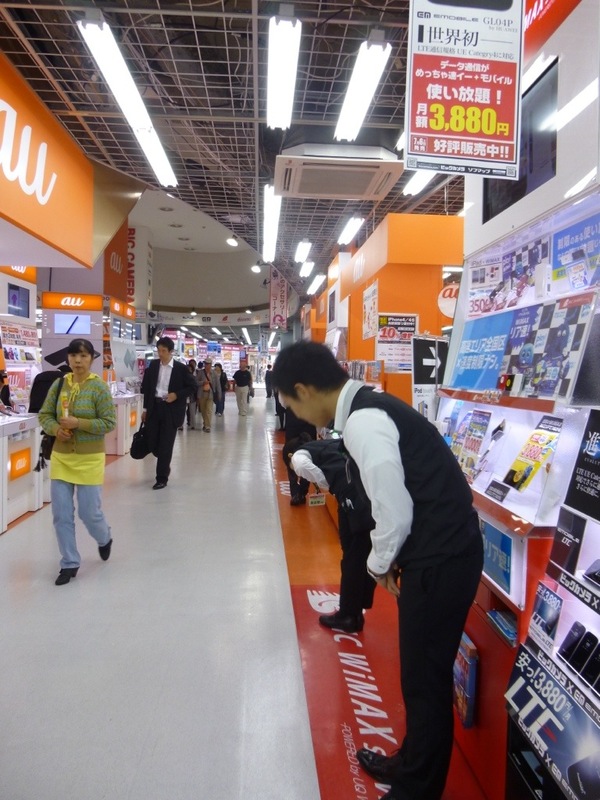 At opening time at a massive electronics store, rows of store clerks lined the aisles bowing repeatedly to welcome customers. Almost any kind of exchange is accompanied with a bow, and within a few hours of landing in Japan I found myself bobbing along with the best of them. I set out to find a Starbucks on my first morning. I know that’s not exactly embracing the culture but I was seriously jet-lagged and thought a latte would have a better chance of keeping me alert than any green tea. I narrowly avoided being run down by pedestrians before figuring out that the convention that requires cars to drive on the left side of the road, also applies to pedestrians. And to make sure you don’t stray from the rules even the sidewalks have a yellow line dividing the lanes. My Starbucks app for iPhone found a location half a block from Tokyo Station. This is the largest commuter hub in Tokyo and on this early Monday morning rivers of commuters streamed out of the station on their way to work. I was struck by the awesome silence of the scene. In the hour or so that I sipped my latte at a sidewalk table literally thousands of people passed by. But other than the scuffle of shoes on concrete there was almost no sound – no collegial conversations, no lively sharing of weekend escapades, no hollering into an unseen earpiece and remarkably very little traffic sounds. (This is a city that runs on mass transit, electric trains that speed noiselessly from hub to hub.) It was a remarkably peaceful scene and, heads down and minds apparently fixated on their destination these Japanese commuters struck me as a singularly serious bunch. I couldn’t resist the urge to have a little fun. So making eye contact with anyone who looked up, I grinned and nodded and bowed to see if I could elicit a smile or even a sign of recognition. I may have overdone it, as the best response I got was an occasional look of concern for my well being. So I adopted a similarly serious demeanor and jumped into the crowd, focusing just as intently on my destination, which at that moment was nowhere in particular. It was a beautiful day and my aimless but serious walkabout took me to The Ginza, which roughly translated means “Fifth Avenue But Not in New York, Baby!” I strolled up one side and down the other admiring some delightful shop windows and drooling over trays of meticulously decorated sweets before heading back to Tokyo Station for my train to Kyoto. I was back in Tokyo again a few days later under quite different circumstances. This day was stormy and blustery, and by the time I had navigated from Kyoto through two strain stations and three different subway lines, it was dark to boot. I had booked Andon Ryokan (guest house) online. 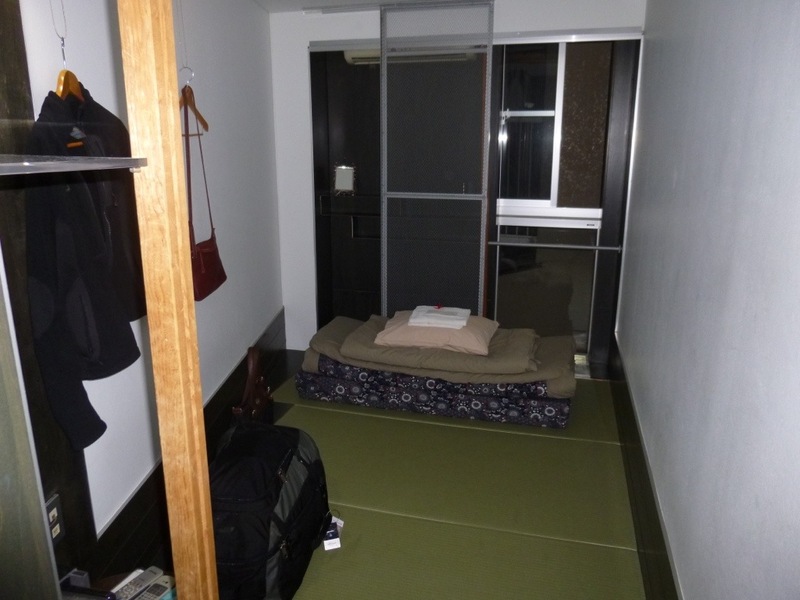 It was one of the last available places near Tokyo center – close to the Asakusa district – where one could “experience traditional Japanese culture” which mostly means sleeping on the floor. I had since seen it advertised as a ‘backpackers hostel’ which aroused a certain amount of skepticism on my part, and more than a little anxiety. I emerged from underground after dark, into driving rain in a warren of small streets and alleys. It was at this moment, within steps of my destination that my sense of direction failed me. I had come out the wrong subway exit and could not find the way back in. And I was in a suburb of Tokyo where no one seemed to speak any English. So I squeezed myself, my suitcase and my dripping umbrella into a pharmacy the size of a public toilet cubicle where, streaming water onto the spotless floor I proceeded to nod and grin for all I was worth, pointing all the time to a number on my iPhone until the alarmed proprietor rang up the Andon. Within minutes a smiling young lady (Yuka) from the hotel was out front on her bicycle to guide me. How to describe Andon Ryokan…well, there are certainly aspects of a ‘backpackers hostel’ to it – the shared sinks and toilets for one, the communal lounge and definitely the absence of an elevator, although they do have a very cool dumb waiter for hauling luggage up and down the five storey building. Only my over-developed sense of claustrophobia prevented me from riding it up with my bags. I will confess, having spent the previous few nights in the four-star Royal Park Hotel in Kyoto, that my first impressions of the Andon were…well…not charitable. But the place is much more than a haven for backpackers and it grows on you. In fact, it began very quickly to feel welcoming, familiar and fun! Having spent my time in Kyoto largely on my own I thoroughly enjoyed sitting in the lounge chatting up Jason from New York, Martin – a high school student from Denmark traveling on a school trip with nine other very well mannered teens, and I got great eating recommendations from a mother and daughter from Finland. On my first evening I took part in a traditional tea ceremony hosted by Yuka and performed by the Tea Master, Soyu. 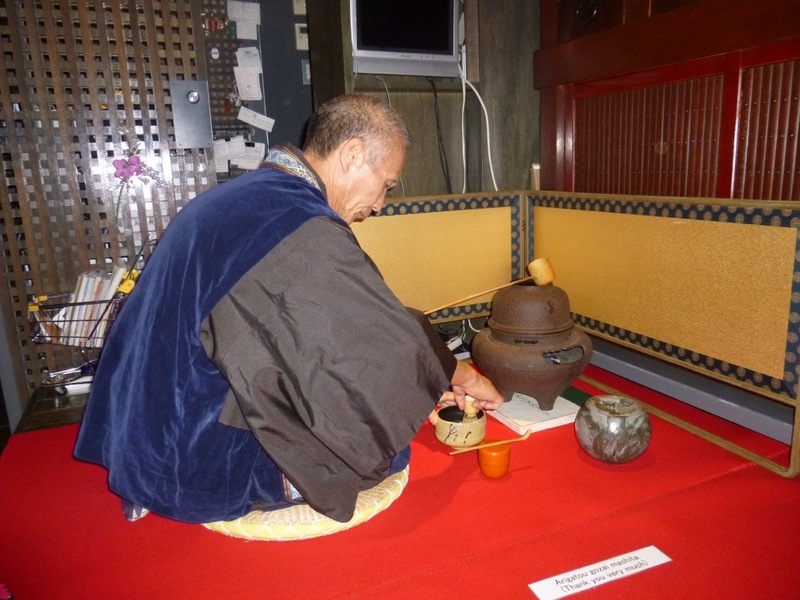 The tea ceremony is a very good illustration of the precision of the Japanese culture. Using the right or left hand for specific actions holds significance, two taps – not three – of the tea scoop, and three fluid motions – not two – to scoop the hot water. Sleeping on a tatami mat under crispy linens was delightful. 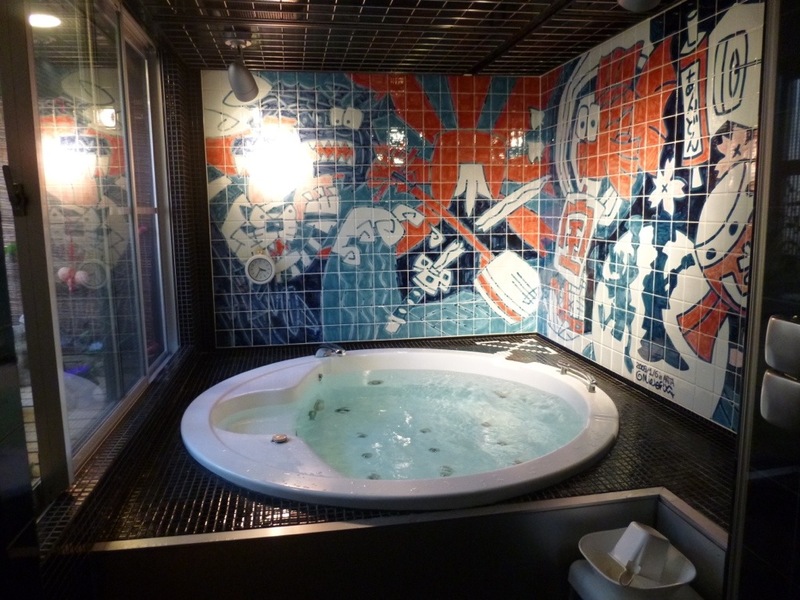 I quickly got used to the shared toilets and baths, and I never really ran into anyone else or had to wait, even though the guest house seemed well occupied. I discovered a good variety of newspapers at the breakfast table in the morning that included my favorite International Herald Tribune. There are pots of umbrellas and bicycles at the front door for guests use, and probably the clincher – there is a delicious private spa on the fourth floor, complete with swiss shower where I spent a lovely half hour after my daily walkabout. The Andon was built in traditional Japanese style and has won prizes for it’s architecture and it’s halls and stairways display traditional Japanese artwork. Most importantly, Andon has a lovely sense of community in a city that can be a bit overwhelming. I was sorry not to have more time here and if my journey takes me home through Japan I will make time for a whole week at the Andon. I can’t wait to see the delightful Andon folks – Yuka, Ryoko and all – again. It sounds like you are off to a great start on your adventure. Can’t wait for the next installement!